Squadron Leader Pearson (Pilot) and his Crew were flying in advance of A & B-Flights in the Support Aircraft Avro York (MW234) (10 Ton Payload) with the Advance Party consisting of Group Captain RCM (Dickie) Collard, various Ground Crew Teams and probably also loaded with general Spares Equipment for the 18,000 mile round trip and the 6 weeks duration Goodwill Tour. 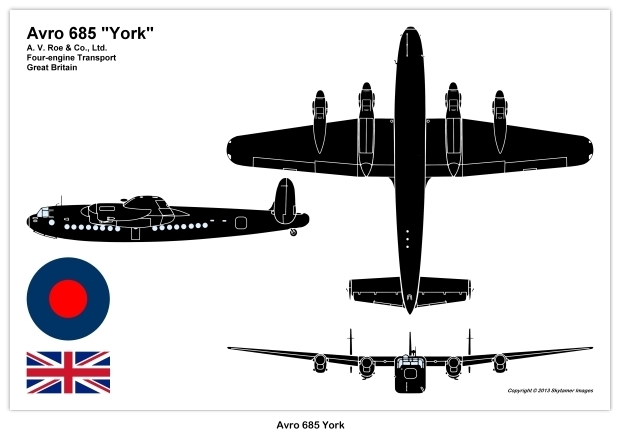 The Avro York was designed to an interim Cargo speciﬁcation numbered C.1/42 and to shorten development time the Wings, Engines, Undercarriage & Tail Unit (production Aircraft had an extra Fin mounted on the Fuselage) were taken from the Lancaster Bomber. Internally, the York could be ﬁtted out with Passenger Seats or as a Freighter or a combination of the 2. 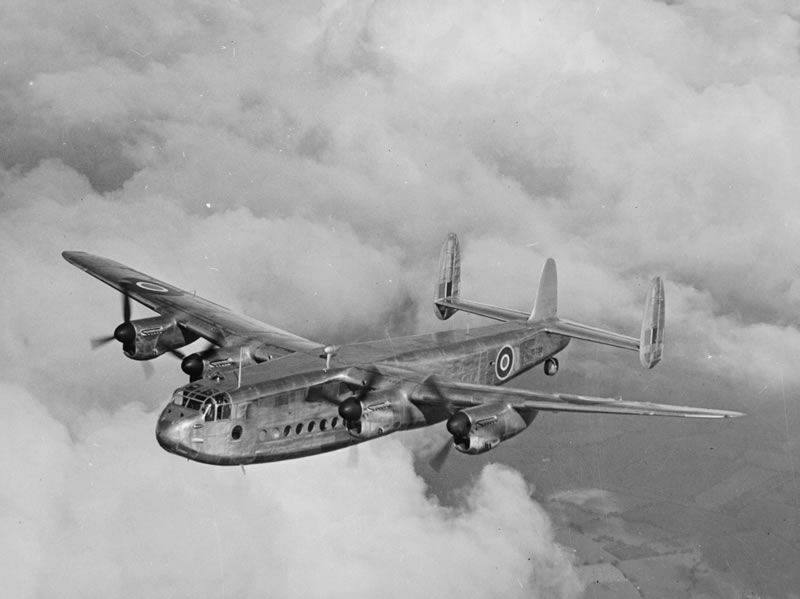 Designed by Roy Chadwick, the York had a new all-metal, square section Fuselage with twice the cubic capacity of the Lancaster. 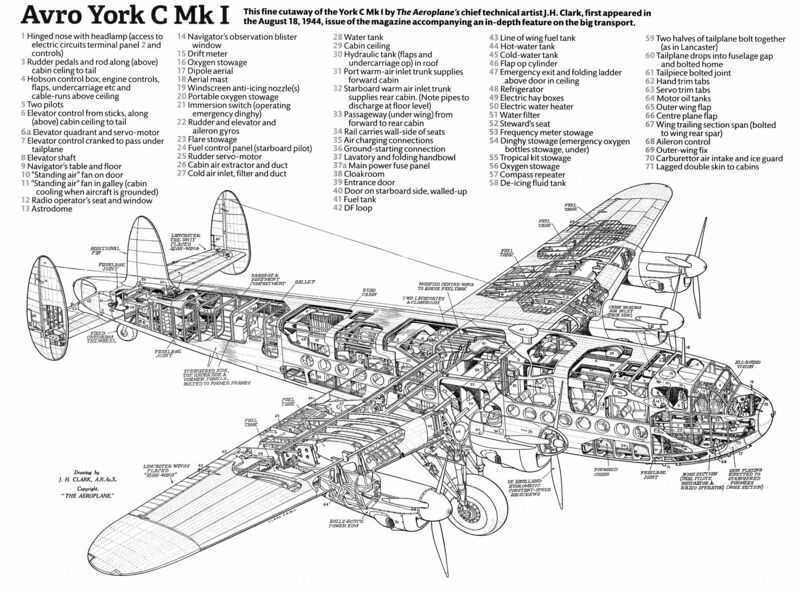 Power was provided by 4 – 1,620hp Merlin T.24 or 502 Engines although a single Aircraft (the prototype LV626) was ﬁtted with a quartet of 1,650hp Hercules VI Engines to become the sole York C Mk 2. Some 203 Yorks were delivered to the RAF from a total production of 257 Aircraft built in the serial ranges: MW100 to MW149, MW161 to MW210, MW223 to MW272, MW284 to MW333 and PE101 to PE108 all constructed at Woodford, Ringway & Yeadon. Range 3000 Miles. Wing Commander Richard Collard, was the son of a Stockbroker and was Educated at Haileybury College. On leaving the School he enlisted in the RAF and was Commissioned as an Officer. Serving with No.4 & No.615 Squadrons, he then became a Flying Instructor. He also played Rugby League in the RAF 1st Team. At the outbreak of War in 1939, Collard joined the Advanced Air Striking Force which was based in France. After the withdrawal from France, he transferred to Bomber Command for a while, and then to the Middle East in Command of No.37 & No.12 Squadrons. In 1941, he was Awarded the Distinguished Flying Cross and in 1942, he received the Distinguished Service Order. He also had the Norwegian Liberty Cross. During a Bomber Raid on Duisburg in 1942, Collard was shot down and taken Prisoner by the Germans. He remained there until the end of the War, then rejoined the RAF. In 1946, he Commanded the Avro Lancaster Goodwill Tour of the United States, and became commander of RAF Stradishall in Suffolk until 1948. He spent the next year in charge of development at the Central Bomber Establishment. He was then posted to the middle east to serve as Group Captain Operations in 1950, and from 1951 he was Group Captain Operations for RAF Coastal Command until he retired from the RAF in 1953. On leaving the RAF, Collard joined the Handley Page Aircraft Company, and became a Director in May 1958. He also became involved in Politics, and in November 1957 he was chosen to follow Brigadier Sir Frank Medlicott as Conservative Party Candidate for Central Norfolk for the next General Election; Medlicott was in dispute with his Association over the Suez Crisis and had resigned the Conservative Whip. His Parliamentary speeches concentrated on RAF & Aviation issues. He also took up Farming Issues, based on his mostly Agricultural Constituency. In March 1960 he appealed to Members of Parliament who visited British Forces’ Bases in Foreign Countries to think about what they reported about the morale of the Servicemen. He defended the government’s decision to abandon the Blue Streak Missile and buy the American Skybolt. Collard was ill in June 1961 and was advised to rest for 2 months. 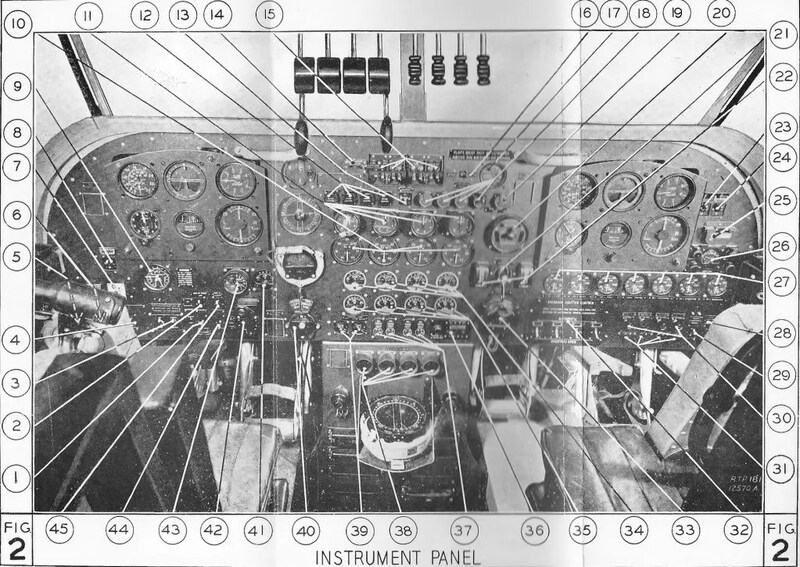 He did return to Parliament and in July 1962 objected to Noise Abatement Rules and their effects on Airlines, arguing that Aircraft took off at the Maximum Load and the Pilots should not be distracted by other considerations. However, in the middle of August, he was found dead at his home in Whitwell Street, Norwich aged only 50 (25 August 1911 – 9 August 1962). He now has a road named after him in Kenley, Surrey, adjacent to the former Site of RAF Kenley. IWM has Film of 35 Squadron Lancasters, Aircrews & Ground Crews on RAF “Operation Goodwill” Tour of the USA 1946 from the East Coast to the West Coast. Reel 1: San Francisco – Military Base during an Open Day – various US Aircraft on Display – overflight by 12 Lancasters in Formation. Constellation, B-17 C-47, C-54 on the Apron. US Army Recruiting Service bus, CBS Info Desk, shot of Lancasters (TW657 TL-C) (TW892 TL-L) & Avro York. Shot of Staff Cars and Senior Foreign Officers being greeted by US Officers. RAF Air Chief Marshal in shot (Sir Guy Garrod). Foreign Officers viewing white painted Lancasters. Street views of China Town, Officers ‘window-shopping’. View of Golden Gate Bridge and local Bay Area. Driving over Golden Gate Bridge. Marshall of RAF arrives by Aircraft, walkabout RAF Station then departs in Dakota (KG782). B-17 overflying Lake, Servicemen swimming, shot of log cabin and Crews sitting around a campfire. Officers throwing rocks into lake. Scene of outdoor swimming pool, couples posing for Photographer. B-29 (521785) taxiing, Lancasters lining up for Take-off. Air to Air shots of Lancasters in Formation flying over (Los Angeles). Shot of Lancasters on Apron (ramp) & Crews on Parade and taking part in March Pasts. Marshalling, taxiing Lancaster & Dignatory Speeches. Air Chief Marshal Sir Trafford Leigh-Mallory was killed 14 November 1944 while flying to his new posting in Ceylon to take command of Allied air operations in the Pacific, when York (MW126) struck a ridge in the French Alps in a Blizzard, 30 miles (48 km) South of Grenoble, France. His wife Dora and 8 aircrew also died. The wreckage was found by a Villager in June 1945.